Here are just some of the glowing success stories from people just like you who have completed their Healthy U Turn with our Registered Holistic Nutritionist in Oakville, Maha Nasr. Maha Nasr is outstanding. I consulted her regarding an acid reflux problem. She provided me with a few easy nutritional steps that within a few weeks "turned around" the condition. I appreciated her warmth and compassion, along with her high professionalism and competency. Maha Nasr is a licensed nutritionist. However, her medical degree from a renowned school and her experience as a physician set her apart. She stresses she is not practicing as a physician and does not prescribe medications. I highly recommend Maha Nasr and her stance that proper nutrition can turn around health conditions that pharmaceuticals fail to prevent or cure. After a long journey with medical doctors and after doing so many tests, I was diagnosed with IBS. I needed to know what and how to eat to get rid of my unpleasant symptoms. After a thorough analysis of my nutritional status, Maha gave me a list of foods to eat and others to avoid, and suggested simple recipes to prepare. She also gave me some alternatives as well as brand suggestions which helped a lot in my grocery shopping. Adding natural supplements to my diet also helped a lot. The results of the program were amazing. I am very satisfied with what I've achieved and grateful for the helpful advice Maha offered me. Thank you very much Maha! “I am now starting my third month symptom free and I love my food again!”—Jill, 41 years. Thank you so much Maha for your recommendations that helped me overcome my digestive problem. Before I met you, I went to two doctors and tried different medications but nothing was working. Your diet and supplement recommendations were so simple but very effective. Your natural approach is the best and your sincere follow up and support helped me to keep on. Thank you so much Maha! I consulted Dr Maha after I was diagnosed with fatty liver, three years following my cholecystectomy operation. I had abdominal pains, gas and bloating all the time and I was feeling so tired, stressed and depressed. Within a few weeks of following Dr Maha’s nutritional program my sleep was much better,my energy levels increased and my digestive symptoms are almost gone. I was also amazed at how my skin looked and felt much healthier and I received compliments from family and friends about it. I am so happy with the results so far and I will continue on my program to achieve complete healing. I highly recommend Dr Maha if you are looking for a talented and caring nutritionist. Before I saw Maha, I was struggling with peptic ulcer, a hypersensitive stomach and poor digestion. I was also overweight and on medication for diabetes and high blood pressure. I was feeling tired all the time and was very disappointed about my aches, pains and overweight. After following Maha’s personalized nutrition program for only 6-8 weeks, I experienced an impressive improvement in my health and I am so happy with the results. I am not feeling tired anymore, my aches and pains are gone and my digestion is much better. I have also lost a few pounds and to my surprise my blood pressure and blood sugar have gone down to healthy levels. I am so thrilled with this great achievement and encouraged to continue on the program. 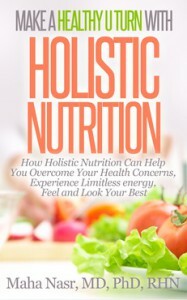 I highly recommend Maha Nasr and her effective holistic nutrition approach which has proven to be very helpful for me. I was struggling with out-of-control sugar cravings, and very bad eating habits. These habits caused me constant nausea and digestive disturbances, as well as brain fog. I felt angry with myself at not being able to better take care of my health and dietary choices. It affected my self-esteem, and I did not like the way my body was beginning to look. After following Maha's program, I started noticing improvements immediately. I was surprised by how well I could feel, and also by how easy and natural the transformation was. The more my symptoms lifted, the more I enjoyed choosing healthier food options. I was also incredibly helped by Maha's constant availability and support, if I needed it. Today I am thrilled with my changed eating habits. I feel good about what I put into my body. I have more energy than I have ever felt before. I just feel good. I don't have dips, ups and downs from sugar crashes and highs, and my digestion is much better.It has been a change in my life physically, emotionally, spiritually...the changes Maha helped me to make have effected me on a deep level that I cannot even begin to explain. I would strongly recommend Maha to anyone who is struggling with any medical issue, or who simply wishes to return to a state of healthier, whole food living. Maha is intuitive, and brilliant at what she does. She made what seemed to be an impossibly difficult turn around easy, organic, effortless and appealing. I cannot recommend Maha Nasr enough, for her warmth, generosity, and the amazing results that I know she will make in your life and in your health. I first contacted Maha shortly after I was diagnosed with ulcerative colitis. She was extremely knowledgeable of my condition and couldn't have been more helpful. Maha educated me about my disease (IBD and formulated a specific wellness plan for my needs. My symptoms began to improve almost immediately! She has been very generous with her time, both in person and on our phone consultations. My experience in working with Maha has been extremely positive. She is an excellent nutritionist … very professional, knowledgeable and compassionate. I highly recommend her services. Before consulting Maha, I was suffering with very low iron, gastro-intestinal and digestive problems and I also desired to lose weight. I looked very pale, felt very weak, faint and tired most of the time, and I constantly experienced bowel irritation and abdominal pains. I generally felt unhealthy and knew that my eating habits were unhealthy and that is what caused all my issues. After only one week of following Maha's wholistic nutrition plan, I began to feel considerably better. I began to feel much better in every way. I could feel my iron levels rising, as I began to feel stronger, more energized and much healthier. Colour started to return to my face and I was no longer so pale, this was a clear indicator that I was overcoming my iron deficiency. My digestion got much better as well. I stopped experiencing bowel disorders and abdominal pains. I generally feel healthier and happier. I also lost some weight , because her diet allowed my body to purify my system of all the junk food and toxins that I had ingested before. Now, a month later, I am still making progress and am very satisfied with the nutritional plan she gave me. I would highly recommend Maha to anyone who has any problem regarding health and nutrition. Her wholistic plan takes into consideration her patient in every degree and she designs a plan that is just right to fit his/her needs all while guaranteeing a healthier lifestyle. I was highly satisfied with my experience and the work she did with me. After trying several diets for weight loss, Maha's approach was the best for my needs. In our first meeting, Maha stressed that her approach is not about dieting but about eating the right way. Her program not only helped me to lose weight but also finally I got rid of the stubborn allergy I had for several years. My energy levels also improved considerably. She introduced me to a variety of new foods and we did small changes little by little. I never felt overwhelmed with all the positive changes I needed to do in order to assume a new healthier lifestyle. Thank you Maha for showing me the way, you're the best! Maha is an excellent nutritionist and her "Healthy U Turn Weight Loss Program" has helped me turn around my nutrition habits from awful to heatlhy in just a few weeks. I have lost 27 Lbs in less than 12 weeks and my pants went down by 3 sizes. I also feel now I have more energy and better digestion. Maha's "Weight Loss program" just makes you feel better overall without feeling hungry or deprived. I highly recommend her! "I consulted Maha because my weight gain was getting out of control. When a friend of mine told me about "Healthy U Turn Weight Loss program" and how she was satisfied with the results, I did not hesitate to try the program. It was simple and easy to follow. I learnt how to eat a healthy and balanced diet instead of my bad eating habits. I lost 20 pounds and I gained invaluable nutritional knowledge to help me keep healthy and in shape forever. Maha was always following up with me and giving lots of support. Best of all, my joint pains and shortness of breath are gone." When I met Maha, I was feeling tired, had very low energy and struggled with digestive problems, migraines and allergies. I felt depressed and also needed to lose some weight. Maha’s weight loss program helped me to regain my health and lose the extra weight. Maha was generous with her support and care throughout the program which made it really easy and encouraged me all the way. Today, I have lost 19 pounds and I feel great about my health and my body. My energy went up dramatically, my digestion is much better and my migraines and allergies are gone. It's such an amazing health transformation for me that I couldn’t have ever imagined. I would highly recommend her to anyone who wants to make real health changes. Dr Maha’s weight loss program was exactly what I needed to help me lose weight in a healthy way. I liked the program because it provided clear diet and lifestyle instructions, easy meal plans and I didn’t feel deprived or hungry at any time. Dr Maha is very knowledgeable, friendly and caring and I would highly recommend her to anyone looking to get back in shape and feeling much more energetic. I went to Maha because I wanted to lose the 15 pounds which I have gained after my marriage. I also wanted to learn how to eat to get healthier and to build muscle. After going on the program for only two weeks, I felt much lighter and more energized and I started losing weight so fast that my personal trainer was really amazed. Maha was always supportive and was flexible with appointments to suit my busy schedule. This weight loss program was worth the investment and I am very happy with the results. I managed to lose 12 pounds inspite of my busy and stressful lifestyle and I am enjoying the new recipes I have tried during this program. I went to Maha because I felt very uncomfortable in my body after gaining 15 pounds in less than a year. I knew that I needed help to get rid of those extra pounds were making me unhappy about my looks and were also starting to affect my joints. I was also interested in trying a new approach because my old diet wasn’t working anymore. Within 2 weeks of starting the program, my cravings were gone, I was able to lose 5 pounds and my joint pains disappeared. I also noticed that my body shape improved and my skin looked much younger. This program was exactly what I needed because it not only helped me to lose weight but I also learned how to make healthier food choices and experimented with delicious new foods that I have now added to my shopping list. I enjoyed the tasty recipes in the program and was even able to eat out with my friends without adding any weight. I have lost 15 pounds, dropped 2 sizes and I am very happy with the results. All my friends are commenting on my new look and showering me with compliments.This program has changed my life and I highly recommend it to anyone who want to lose weight while enjoying their life. I Lost 12 lbs in less than 3 weeks.. Yaaay!!! and became more healthy and feel much better!!!.. Many thanks to Dr. Nasr .. Before I went to her, I felt fatigued all the time, needed to lose "a lot" of weight as well as having trouble with bloating, premenstrual syndrome and feeling "down" frequently.. My weight issue was the main issue that brought me in. She told me that she is not gonna make "just a weight loss program" and said we must detoxify the body and become more healthy.. Her diet was very good. I didn't feel "starved" or anything and I almost instantly felt my mood massively improve. My energy level at first was low but then went high and I was feeling "very good". Didn't get the premenstrual pains & depression this month as well. She also goes an extra mile and really cares. I am continuing with the "Holistic" health and "weight loss program" and loving it. Thanks Dr. Nasr! Dr Maha was the first nutritionist I dealt with that helped me to lose weight smoothly without the struggle , cravings and the day by day suffering of feeling That I am actually on a diet ! She handled my food preferences and subtly tailored my plan to conveniently suit me in addition to fit my daily schedule and challenges. Through her detailed assessment I was surprised that I had issues related to my adrenal function affecting both my already known low thyroid function and this was hindering my weight loss. After addressing such problem , I quickly felt vibrant , energetic and extremely healthy and the weight loss became consistent . She also guided me on which supplements generally I additionally must have at my age to ensure a sound hormonal balance , take care of my bones and set me on a healthy maintenance plan for life. Her approach was really comprehensive , professional as I learnt a lot and from the first week of cleansing felt re-energized. I highly recommend her for not only weight loss but any health problem. I went to Dr. Maha because I was struggling with weight loss, felt so depressed and moody and nothing I tried was working. With her weight loss program, I noticed improvements in just a couple of weeks, lost weight so quickly, felt more energized, my mood swings improved a lot & felt much lighter. I was very impressed with the results I got by the end of the program (lost 35 pounds in 6 months) and all my friends were asking me about the secret for such a success so I sent a couple of them her way and they were also happy with the results. I recommend Dr. Maha because her approach helped me to easily make changes to my lifestyle and feel healthier and her personalized weight loss program is different from all the other weight loss programs out there. This program transformed my life & made me a much happier person. I did a detox program with Maha and the results were amazing! Now my energy level is high especially in the afternoon, I am very calm (no more moodiness) and my sleep is much better. I really recommend Maha if you want to kick start your health and make better choices in your diet and lifestyle. I tried Maha's detox program and I enjoyed it very much. The program was very informative and the supportive follow up helped me a lot. It was a new experience for me but the recipes were so easy and tasty and I never felt hungry on the detox. At the end of the program, I felt much lighter and more energetic. I would definitely recommend Maha's detox program to others. The cleanse program with Maha was a very good experience for me. I learnt a lot of helpful information including how to incorporate healthy foods in my diet, organize my eating habits and have a healthier lifestyle. I liked the menu plan very much. The program helped me to be more relaxed and better adapt to stress especially in the morning when I was most tense. I highly recommend the program to anyone looking to make a difference in his health. I am so glad I consulted Maha about my hyperactive 5 year old daughter. The results I had within a few weeks were amazing. The impact of the diet changes and supplements on my little Tara was huge. She calmed down a lot and became easier to handle. Thank you very much Maha for your support! Thank you very much Maha for this amazing detox program! I really enjoyed it and it was an important step that I needed to take for my health. It was a very empowering experience. After this program and with all the diet and lifestyle changes I made, I felt totally renewed from the inside out. My energy is soaring, my sleep is deeper, my cravings are gone, my skin cleared up and I feel much lighter. I also lost those stubborn extra pounds hanging in my belly. I liked that everything was done for me and you made it very easy with the clear handouts you provided. Apart from a mild headache in the first day, I felt great on the program. I highly recommend trying Maha’s advanced detoxification program. This is definitely a winner! This detox program definitely exceeded my expectations! I found that after the first few days, I had more energy, and my digestion improved. I felt lighter and less bloated, had better quality sleep, and my overall mood shifted to a more positive vibration. People even commented on how radiant I looked, and how my skin glowed the following week! I have learned how to eat a more alkalized diet and feel satiated with healthier snacks and meals. I am now more conscientious of what I am putting into my body to fuel it and hoping to implement some of the strategies I learned through the program on an ongoing basis.I absolutely loved this program.Thank you so much Maha!! I would highly recommend this detox program to anyone looking for a delicious, healthy, and safe cleanse that incorporates a complete holistic system of care to help bring forth optimal physical and emotional well-being. I had the pleasure to experience my first-time detox with Dr. Maha. I thought about the detox because I haven't been feeling well for quite sometime despite of a good night's sleep. After consulting with my family doctor several times and doing all possible lab work, all test results came normal but I knew something was wrong, so I decided to try a detox. Dr. Maha guided me through a comprehensive and easy 10 day detox plan. My experience was great: I felt fresh, lighter, satisfied with my diet and above all much more active. The plan was only for 10 days, but the experience and invaluable tips I've learned are for life. I would highly recommend Maha..... she is honest, knowledgeable and supportive. It was Hippocrates, the father of medicine, who said 'Let food be thy medicine and medicine be thy food.' Dr. Maha Nasr understands this intrinsically and has shown me that holistic nutrition is fundamental to my health and wellness. I came to her a couple months ago with a diagnosis of breast cancer. She gave me a comprehensive overview of cancer-fighting foods and good sources of nutrition, and a detailed wellness plan designed just for me.This plan has improved my health, energy and attitude. I am feeling better every day because of Dr. Nasr, and I would wholeheartedly recommend her to anyone who wants to improve their health through a holistic approach. “I contacted Maha after being diagnosed with breast cancer. Before trying her cancer coaching program, I started doing some diet changes on my own but felt confused and insecure. Her in depth diet recommendations helped me a lot with making the right diet choices and with the specific supplements she recommended, I felt protected that I am giving my body what it needs to fight the cancer. The techniques she recommended for dealing with daily stress and increasing my energy helped me a lot during my treatment sessions. I am very excited. I just had a call from my oncologist.. She told me that the CT and bone scan that were done this week showed that I have made marked improvement ! Less lymph system activity, fewer spots, less tumor mass. I could not take in what she said about the report. I was so relieved that she confirmed how I have been feeling,.......really healthy and really good.Thank you so much Dr Nasr for your continous support and care! I was diagnosed with lung cancer and I decided to sign up for Maha’s cancer coaching program because I realized I needed help in changing my diet and lifestyle. I also felt confused and uncertain about my treatment and my oncologist didn’t provide enough information to help. Maha was very knowledgeable about my condition, answered all my questions and provided simple and helpful tips to deal with any unwanted side effects of treatment. She also recommended specific foods and natural supplements to boost my immune system and energy levels. Her recommendations were spot on and helped me go through my treatment with very minimal side effects. A few weeks after following her plan, I felt so much energetic than I’ve felt in a very long time. Maha is a trusted expert in the field of cancer nutrition and I can’t recommend her enough. Mark E., 62 years, B.C. I reached out to Dr Maha after being diagnosed with stage IV breast cancer, totally disfunctional and weak with tremendous anxiety and fear was looking for someone to assist me during my chemotherapy and radiation treatment and tell me what to do after to avoid recurrence . As a certified cancer coach, Dr Maha was already aware with my sufferings, she skillfully and professionally accommodated my condition, coached me closely with attention to even the smallest detail and helped me regain again my sense of security. She was patient, very conscientious and knowledgeable answering all my questions whilst phasing out a complete change in my life. With her expertise and compassionate care my recovery was smooth and I regained my strength and well being in a very short period of time. Today I follow her protocol and feel that I am on a safe track. Thank you Dr Maha for your sincere dedication and patience. I strongly recommend her to anyone diagnosed with cancer as her coaching is exceptionally valuable to the recovery journey. Maha gave me a wealth of options for cancer support from nutritional guidelines to help remove toxins from my body and make my body more alkaline, which help in fighting cancer, to mind-body techniques like visualization and meditatation. Maha has gathered all possible information on nutritional, environmental, mental, spiritual and lifestyle factors in fighting cancer and giving treatments the best chance to work effectively. She is providing a tremendous service to cancer patients. Thanks Maha for doing what you do. I went to Maha because I needed help with my stubborn adult acne and migraines. Maha‘s approach was so detailed and to my surprise she pointed out that my symptoms are related to each other. She gave detailed recommendations and explained how each can help with my condition. Her generous handouts were a great resource too. Not only did my acne and migraine improve, but my whole health and my family’s as well. I learnt a lot of practical and useful tips to live healthy. Maha is a highly knowledgeable nutritionist whom I would recommend to anyone looking for a natural solution for health problems. I was struggling with acne, allergies, eczema headaches, and digestive problems. I was feeling hopeless and I thought there is no cure, because I tried everything and it didn't work- from different kinds of creams to pills none of it worked and it was a waste of money. Maha guided me to the natural way to cure my health issues. I recommend that u go and give it a try, she won't let you down. I made a good decision by coming to her because now I feel great!! My consultation with Maha was life changing for me. Before I met her, I was feeling so stressed and tired all the time. She explained what was going wrong and designed a comprehensive health plan just for me. A few days after following the plan, I started feeling a noticeable improvement in my energy level and sleep. I felt better and better everyday on the program and within 12 weeks I felt completely different. I have never felt better in my life. I definitely recommend Maha's nutrition services! I will be always grateful for all the help, advice and sincere support you have given me. You helped me transform my life! You deserve all the best for your efforts and credibility. Wish you more success in the future. I had the privilege to get to know Maha Nasr at the Canadian School of Natural Nutrition (CSNN), while studying to become Registered Holistic Nutritionist. Maha is a confident and highly knowledgeable Natural Nutritionist. At CSNN she shined like a star and graduated with honours. I've sent her a few clients and they were all extremely happy with the results. In a nutshell Maha is amazing! I decided to see Maha after I had been diagnosed with advanced adrenal fatigue following a severe adverse reaction to a medication. Although I considered myself a ‘healthy eater’ I was having trouble sorting through all the (sometimes contradictory) information I could find about how to eat to improve my condition. As a person who values her health and independence greatly I was very frustrated with my symptoms and was determined to do all I could to regain the functionality that I had lost. After following Maha’s protocol for approximately two weeks I noticed an increase in energy and mental alertness as my ‘brain fog’ lifted. My energy improved and over the first two months I also lost a significant amount of weight which has really helped with my self-esteem and overall mood. Since I started developing habits that help me avoid blood sugar crashes I almost never feel hungry, which has been very liberating. I was struck at how early on I felt better and I feel confident now that I am properly nourishing my body so that it can recover fully. I will continue to seek Maha’s help as I continue on my journey to wellness and would highly recommend her to anyone seeking a highly qualified professional who understands the needs of complex patients and truly believes in the innate healing power of food. Dr Maha was very helpful and actually cares for her clients. Even after the session ends, she was always available via email for any issues that I had. The diet she started me on worked wonders on various aspects of my life. First of all with weight loss, it felt so easy and quick with her. Weight is no longer an issue for me after struggling with it for years. The healthy diet also made me feel rejuvenated and ready for the day; which was completely unlike my previous diet/lifestyle that made me feel sluggish after every meal. I will follow all her diet recommendations for life as it has made a tremendously positive impact on my life and I have been recommending it to family and friends too. The healthy foods led to a healthy mind and therefore a new life. Dr.Maha has helped me alot, with allergies and food intolerances. she is really helpful and knows nutrition inside and out. I went everywhere but didn't find anyone that can help me until I found her, if you want to improve your health naturally without taking any pills then Dr.Maha is the one! I have been on the path of healthy eating for a long while now & through different approaches before seeing Maha,I had managed to get some positive results, but I knew I was not yet at the optimum health I was desperately looking for.That's why I went to see Maha. I was struggling to find the right way, according to my personal physical needs, to get the right nutrients with the right amount to my body.I was struggling with sweet but mostly salty cravings,low energy,fatigue and most importantly constipation and migraines. Maha is a sweet professional lady, who has helped me through her knowledge of holistic nutrition, reach better health results. All my symptoms are much better and I am very happy with the results. I would strongly recommend Maha to anyone who is in need of professional guidance through holistic nutrition for better health. Before I met Maha I was struggling with lack of knowledge about good food and nutrition. Being Vegetarian is not easy and as much as you look it up on the internet, you don't understand what is right for you to eat. Not eating right made me depressed, cranky, moody, bloated and I was getting heart burns too, usually at nights. I did not had any idea that is happening because of what I am putting in my mouth. Then I looked up for a Nutritionist online and that is how I met Maha. She answered all of my questions and told me what am I doing wrong. She gave me knowledge about variety of foods and helped me with some recipes. After few week I noticed a lot of change in my skin, in my moods and there were a lot of changes in me because I was eating right. I feel happy with my improvements. As a person Maha is polite, approachable, professional and friendly. I would recommend her because she put a lot of effort in providing me the right information and she knows what she is doing. I have struggled to maintain a healthy, sustainable weight since childhood. I find that I fluctuate in weight quite often. I can go through periods where I am very focused on my diet and exercise but slowly my good habits fade over time and I find that I put the weight back on. I made a decision to meeting with a nutritionist to try to break this habit and educate myself on the importance of a healthy diet on my overall health. What I wanted from my meeting with Maha was to educate myself on the food I am eating and the impact it has on my body and health. I wanted to find a plan that is maintainable and that I can incorporate into my lifestyle. I can get frustrated when I fall into a phase of poor eating and can find that within a few weeks or a month of this poor eating I can pile on the weight that it has taken me the previous months to loose. This is the main habit I wanted to break. After meeting with Maha, I definitely noticed differences in my body and my health. I am now more conscious of how my body feels after I eat. Maha also discussed the importance of having a good balance of supplements in diet to regulate my hormones and thus make food cravings more manageable. Although supplements are not something that I would previously have added into my diet having recently added these and become educated on the benefits these have to my overall health I can feel that these are beneficial to by body and overall health. I feel positive about my health at this time. I feel educated and feel that this education will assist me long into the future. I found Maha very informative when it comes to food and the benefits of good food for the body. I would definitely recommend Maha.